Allows us to prioritize the important areas of life and clarify what we intend to achieve in these areas: When you know where you want to be, it is easier to monitor progress in the six most important areas of life i.e. health, significant other, family and friends, career, finance & personal growth. 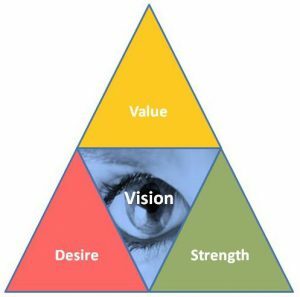 Provides the ability to leverage ‘desire motivation’ rather than ‘prevention motivation’: Visioning and proactively setting goals creates a desire motivation that continually provides fuel to achieve our objectives. On the other hand, reactionary individuals and procrastinators who rely on motivation to prevent undesired outcome are driven only until the situation is averted. Supports building of competencies and effective habits: To achieve our goals it is important to evaluate our current competence level and habits that support our efforts. This allows us to bridge the gaps in competencies and create new habits to achieve the goals we set for ourselves. Clarifies values and beliefs to assist in congruent decision making: Strategic vision based on clarified values will support our life’s purpose and keep us integral at all times. Being congruent with oneself gives us immense inner strength and confidence to achieve the most difficult goals and be successful in life. Helps utilize our resources optimally: Making decisions aligned to our purpose and goals will ensure we do not waste valuable resources such as our time and financial capital. Every right decision takes us one step closer to achieving success. Promotes self-leadership: Being in charge of our lives, knowing where we are heading and being decisive are qualities of a good leader. Self – leadership not only results in success but is also foundational for those who want to be great leaders. Provides clear line of sight: Having the target in sight dramatically increases your chances of hitting it versus not knowing what your target is. Visualizing success is more than half the success battle won. This entry was tagged Strategic Visioning, Vision Statement, Vision. Goal Setting, Visioning. Bookmark the permalink.